Three Syrian tanks entered the demilitarized buffer zone in the central Golan Heights on Saturday, leading the IDF to raise its alert level in the area. The Israeli army has also lodged a complaint with UN forces enforcing the ceasefire in the Golan Heights. 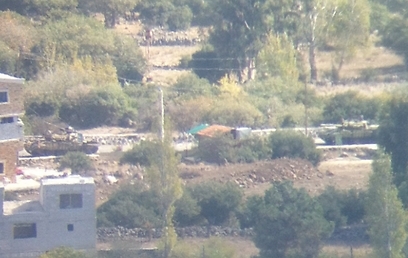 The Syrian tanks entered the village of Bir-Ajam, located just a few kilometers from an IDF outpost, and took part in battles against Syrian rebels. Over the past 24 hours a number of mortar shells fired as part of the Syrian infighting landed in the demilitarized zone. One of them may have been the cause of a fire that erupted Saturday at Mount Hosek, located near the Israel-Syria border. Also on Saturday, Syrian rebels launched a dawn assault on a strategic airbase in the north of the country, trying to disrupt strikes by warplanes and helicopters that pound rebel-held towns and give the regime of President Bashar Assad a major edge in the civil war. The assault, reported by activists, comes a day before the start of a key international conference in Qatar at which the United States and its allies aim to reorganize the opposition’s political leadership and unite their ranks. The leadership-in-exile has been widely seen as ineffective and out of touch with rebel fighters on the ground. Rebel forces attacked the Taftanaz airbase early Saturday morning in fighting with government forces that continued into the afternoon, the anti-regime activist Syrian Observatory for Human Rights said. Joining Syrian rebels in the attack were fighters from Jabhat al-Nusra, an al-Qaeda-inspired Islamic militant group made up of foreign jihadis, according to the Observatory. Al-Nusra fighters, who are considered among the most experienced and disciplined among the opposition forces, have led attacks on other airbases in the north in past months. The Taftanaz base mainly houses military helicopters, near the main highway between the capital Damascus and the northern city of Aleppo, where rebels and the military have been battling for control for months. Online activist videos claim to show the battle, with rebels firing rockets and mortars, and smoke rising over buildings and an airstrip area. An activist speaking in the video identifies it as an attack by rebels and Jabhat al-Nusra on the base. The videos appear genuine and are consistent with other Associated Press reporting in the area.